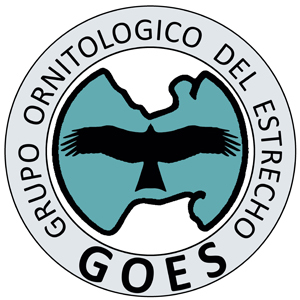 The Ornithological Group of Estrecho (GOES), formed in 1982, studies and protects wild birds and their habitats. It operates a ringing station and here and elsewhere more than 90,000 birds have been ringed since 1983, both resident species such as white storks and the many migrants that rely on this route to and from Africa. Other work includes publications and school visits. "Iberian Chiffchaff: we want to characterise our populations (Cadiz and Malaga) with regard to biometrics, phenology and moult. "Tawny Owl: we want to know if there is exchange between North African birds (ssp mauritanica) and our birds (ssp aluco). DNA analysis is needed. "Chaffinch: we are looking for a way to distinguish females of the north african population (ssp africana) and Iberian population (ssp coelebs)." The Honeyguide group in September 2011 visited GOES as they were ringing birds caught in the reedbed by the small Guadiaro estuary. It was a fascinating demonstration and here are some pictures from that morning. Left: Group member Brian Austin, a licenced ringer, examines a warbler. Right: taking measurements of a Cetti's warbler. Note the short, rounded wings on this resident species of warbler. Cetti's warbler in the hand, showing chestnut rump and rounded tail. In the GOES hide looking towards a marbled duck (below). Impromptu help for the vertically challenged!